A few weeks ago, regular readers will recall I got involved in a surreal argument about whether Nigeria had any decent mountains with some immigration officials in Maidugiri. Finally, I find out that Nigeria does in fact have a biggish mountain. Its called Gangirwal (intriguingly called the 'Mountain of Death'). 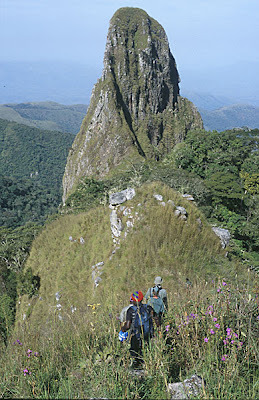 It stands at 2,419m (7,963 feet) in a remote corner of Adamawa State. The mountain and the region it is in - the Gashaka Gumti National Park (Nigeria's largest National Park - 3 times the size of Greater London) is the focus for quite a lot of research, especially in primatology - see here for UCL's Primate Project based there. Also click here for more pics from a New Zealand-based research project. Gashaka Gumti certainly has interesting eco-tourist/trekking potential - with leopards, chimps, giant forest hog, buffalo and klipspringer to see as well as incredible views of Cameroon and Nigeria from the roof of the world. Anything more populist should be discouraged as it would disturb the 'keeper of the mountain'. There's little danger of this happening anytime soon anyway - its a 12 hour drive to the park from Abuja! As well as a site for local spirits and history, there's also an interesting piece of history between the Germans and the British in the area. There was a ferocious 3-day fight between the two sides in this area during the First World War. I'm planning my trip as I write..
world war 1? on nigerian soil?